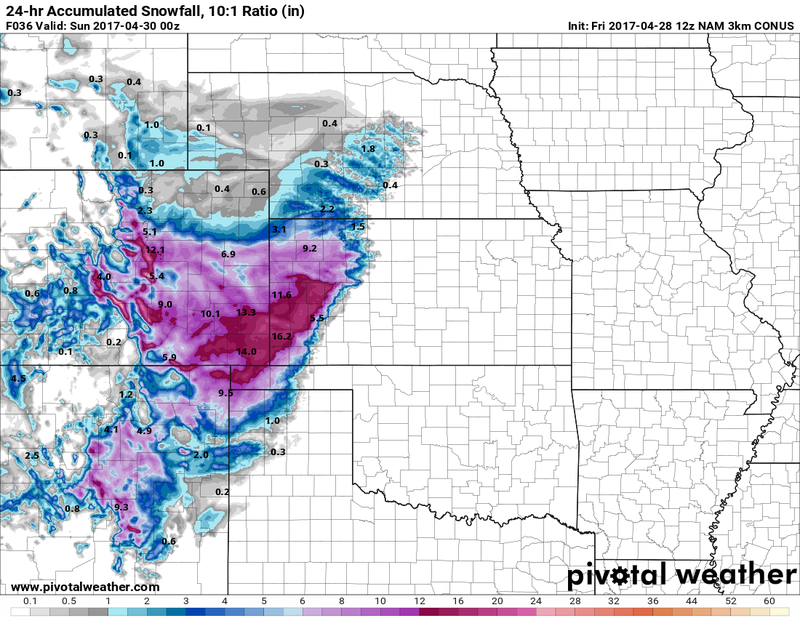 April Spring Storm – We Want Your Snow Totals! As our weekend storm system continues to evolve, we are getting a better picture at what areas are likely to see significant snowfall accumulation and what areas will see a less impactful event. Modeling has still been a bit mess but overnight nearly every one has trended upwards with snowfall along the Palmer Divide. Why is that? 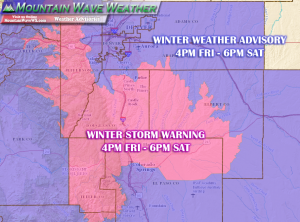 A strong northerly wind may allow enhanced upslope across most of the Palmer Divide region, meaning as you get into areas South of C-470 you could see atmospheric conditions that enhance snowfall. A Winter Storm Warning for heavy snow means severe winter weather conditions are expected or occurring. Significant amounts of snow are forecast that will make travel dangerous. If you must travel…keep an extra flashlight…food…and water in your vehicle in case of an emergency. Analysis – What Changed Overnight? 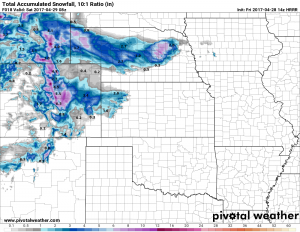 Models are still all over the place but nearly every one has trended upwards with snowfall along the Palmer Divide and front range foothills. Why suddenly the more snow when the storm track looked pretty bad yesterday? Well the storm track has stayed pretty much the same since yesterday’s models but the one big change is how rapidly it strengthens as it moves East. Most models now have the storm system intensifying sooner, which means we will see a stronger upslope component earlier than anticipated. Notice how strong the low gets as it moves Eastward. 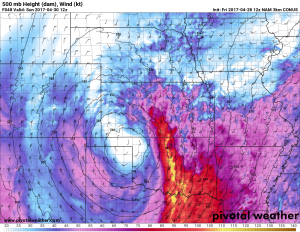 This will bring strong Northerly and Northeasterly winds with an upslope profile that will favor the Palmer Divide and foothills… Denver not as much. The most important thing to remember is the models have not been very good this year with snowfall forecast, they’ve overdone snow totals in nearly every case. This combined with how the storm system is expected to behave is why we are only upping the snowfall totals slightly on our own forecast. This may contrast with the NWS a bit, but it’s what we got! 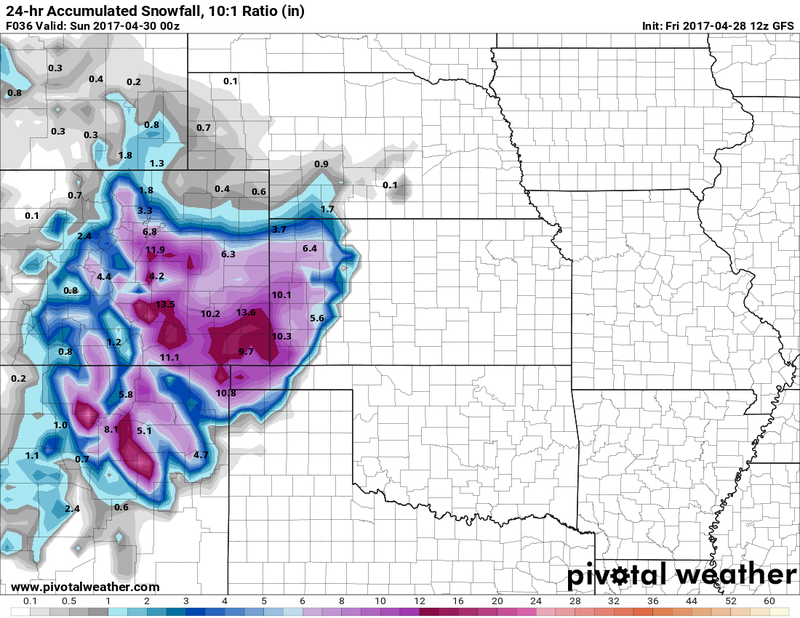 For what it’s worth, here’s the probabilistic spread for snowfall in Douglas County. Temperatures will drop through the day Friday and end up in the mid to lower 20’s late Friday night into Saturday morning. Temperatures this cold will promote snow accumulation. Castle Rock and Northern Palmer Divide: Early snowfall estimates are in the 5-10 inch range for storm total accumulation. Some localized areas may see up to 12 inches. Hard Freeze is expected Saturday night and Sunday night; this will lead to damage to sensitive vegetation and unprotected above ground sprinkler systems.